This category is used to post items of a technical nature and/or technical tips we can all use to maintain our cars. These articles, tips and/or videos come from a good number of places. If you have a technical article or just a tech tip, send us a note at mogsouth@yahoo.com. LIKE THE KID WHO FLUNKED FIFTH grade and then grew up to become a decent stockbroker, the troubled youth of GM’s 215-cubic-inch (3.5 liter) aluminum V-8 didn’t hinder its fruitful life. Born in 1961, this resilient engine introduced turbocharging to production cars but failed to earn a sufficient U.S. audience, whereupon it was sent to England to live out its life in everything from Range Rovers to TVRs. Along the way, this mill, commonly known as the “Buick aluminum V-8” for reasons that will soon be explained, inspired countless designs and enabled a cottage sports-car industry. It was the only American engine design ever to win a Formula 1 title. One could argue that GM’s aluminum V-8 was every bit as ingenious as the Chevy small-block. General Motors began studying aluminum V-8s in 1950 to power its LeSabre and XP-300 dream cars. Although cast aluminum had been used early in the 20th century for crankcases, constructing entire blocks and cylinder heads out of this material was a major breakthrough in the U.S. In Europe, Alfa Romeo, Ferrari, Lancia, Porsche, Rolls-Royce, and Volkswagen perfected aluminum construction after World War II. The success of VW Beetle imports convinced U.S. automakers they would need downsized cars powered by smaller and lighter engines to compete. In 1960, the Chevrolet Corvair began the move to aluminum engines, followed by Buick, Oldsmobile, Pontiac, Plymouth, and Rambler in ’61. Aluminum’s appeal is a density, or weight per volume, that is 60 percent lower than that of cast iron or “gray iron,” until then the traditional engine-block material. Per pound, aluminum yields two to three times the bending stiffness and strength of cast iron and three times the tensile strength. Aluminum’s downside is cost. Iron ore is simply mined, melted, and mixed with a few ingredients before casting, but refining aluminum is a complex, energy-intensive process. First, bauxite ore, a claylike material, is mined. 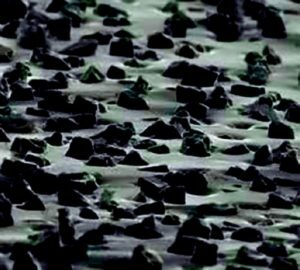 After melting and settling, alumina (aluminum oxide) in the molten ore is purified with an electric current, a process called electrolysis. Because of aluminum smelters’ high electricity consumption, they are typically located near hydroelectric dams, where the electricity is plentiful and cheaper. As a result, aluminum typically costs five times more per pound than gray iron. In the mid-1950s, GM engineer Joseph Turlay, who designed Buick’s first production V-8 for the 1953 model year, topped an experimental cast-aluminum block with hemi heads, a supercharger, and dual carburetors to produce 335 horsepower from 3.5 liters. That V-8’s 550-pound weight was a major breakthrough compared with the typical 700-pound iron-age engine. GM engineers soon began work on a production aluminum V-8 to power the Buick Special, Oldsmobile F-85, and Pontiac Tempest slated for 1961. Buick won the development and manufacturing assignments, with Turlay overseeing and Cliff Studaker assisting the engineering effort. GM’s game plan was to use a stretched Corvair unibody to underpin its new compacts. More refined ride and handling would, hopefully, justify higher prices for the upmarket models. In addition, the aluminum V-8 would foster weight savings throughout the chassis, thereby improving performance. Toward that end, the 3.5-liter V-8 was a showcase of light design. The block, heads, intake manifold, timing chain cover, water pump, and water outlet were all made of GM’s 4097M aluminum alloy containing II-to-13-percent silicon. This added material lowered the aluminum’s melting temperature, helped it flow more readily into molds, and reduced shrinkage during solidification. 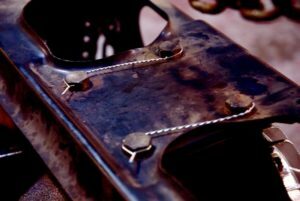 A touch of copper was added to improve corrosion resistance. The pistons, rocker arms, and carburetor were also aluminum. The final 324-pound dry weight was 200 pounds lighter than Chevy’s small-block and roughly half the weight of Buick’s 6.6-liter V-8. Combining an 8.8:1 compression ratio with dished piston crowns and shallow combustion chambers achieved detonation-free operation on regular gas. The spark plugs were located within half an inch of the bore center to minimize flame travel. The 3.50 inch bore and short 2.80-inch stroke minimized piston speed and engine height. Because aluminum expands significantly more than iron when heated, the engineers worried that steel bolts screwed directly into aluminum threads might loosen in service. Testing proved the bolts would maintain the desired torque if they were well lubricated during assembly. Aluminum-block manufacturing was the one area where Buick ventured into the unknown. The technique adopted was called semi-permanent mold casting, because it mixed conventional sand cores with permanent steel dies. Sand cores defined the internal coolant passages and the crankcase portion of the block. The reusable steel molds used for the outer flanks, deck surfaces, and valley area saved manufacturing minutes and provided a smoother finish than was possible with sand cores. Following dyno development and a million miles of durability testing, Buick’s engine was tuned to deliver 155 (gross) horsepower at 4800 rpm and 220 pound-feet of torque at 2400 rpm, with a relatively flat torque curve. Upping the compression ratio to 10.25:1 and adding a four-barrel carburetor hiked output to 230 pound-feet and 185 horsepower, or 0.86 horsepower per cubic inch. Chevy’s 283-cubic-inch V-8 delivered 230 horsepower (0.81 horsepower per cubic inch) with a four-barrel carburetor. Oldsmobile entered the 1961 model year with a version of this V-8 called the Rockette to evoke a family tie to the Rocket 88. To make efficient use of manufacturing facilities, Buick cast all the blocks and crankshafts, and Olds manufactured its own heads, pistons, valvetrain, and intake manifolds. One significant difference in the blocks was Buick’s use of five head bolts per cylinder whereas Olds preferred six (stay tuned for the reason why). Pontiac equipped most of its Tempests with what it called an Indy Four—basically, a V-8 chopped in half—with the Buick 3.5-liter V-8 available as an extra-cost upgrade. The racing community was impressed by America’s new small V-8, too. Mickey Thompson concluded that this ultra-light engine was the ideal means of rattling the Offenhauser crowd at Indy. In 1962, Dan Gurney qualified eighth in Thompson’s Harvey Aluminum Special powered by a 4.2-liter Buick V-8, but he dropped out half-way through the race with a broken gearbox. Unfortunately, the buying public didn’t swarm to the General’s new premium compact cars. Only Pontiac topped 100,000 sales in 1961; combined Special/F-85/Tempest sales exceeded the Corvair’s volume by only 10 percent. The issue was price. The cheapest Olds F-85 cost $118 more than a Chevy Bel Air. Instead of merely hoping sales would rise, Buick and Oldsmobile swiftly rejiggered their game plans. In 1962, Buick moved down-market, and Oldsmobile grabbed the next rung up the price ladder. Buick’s 1962 companion to the aluminum V-8 was a V-6 made by whacking one cylinder per bank. To spare the higher cost of aluminum, the block and the heads were converted to cast iron. Keeping the V-8’s 90-degree V-angle was hardly ideal from a vibration standpoint, but it did allow machining the new V-6 with existing tools. What began as a crude expedient eventually ended up as GM’s rock-star 3800 V-6, a story for another day. Oldsmobile promoted its Rockette aluminum V-8 to Jetfire Turbo Rocket status by adding a Garrett AiResearch turbocharger fed by a single-barrel side-draft Rochester carburetor. Beating Chevy’s Corvair Monza Turbo to market by a few weeks gave Olds bragging rights for the world’s first turbocharged production model. Peak power surged to 215 horsepower at 4800 rpm—clearing the one horse-per-cubic-inch hurdle. The torque curve peaked at a potent 300 pound-feet at 3200 rpm. Without major changes to the host engine or any loss of smoothness or drivability, midrange torque rose by 40 percent. Turbo pinwheels spinning at 90,000 rpm were supported by aluminum sleeve bearings lubed by engine oil. Exhaust gas accelerated the alloy-steel turbine wheel from 40,000 rpm during cruising to 80,000 rpm in less than a second after the throttle was floored. An exhaust waste gate built into the turbocharger limited boost pressure to 5 psi. Instead of lowering the naturally aspirated V-8’s 10.25:1 compression ratio, which would penalize efficiency, Oldsmobile devised a system that metered Turbo Rocket fluid during boost conditions in a 1:10 ratio with the gasoline consumed. This 50/50 elixir of distilled water and methyl alcohol (antifreeze) with a splash of corrosion inhibitor cooled the gas and air mixture sufficiently to forestall detonation. To their surprise, Olds engineers found that the alcohol content added six horsepower to peak output. The tank that stored this juice was pressurized by a tap off the turbo’s compressor to force delivery to the carburetor’s float chamber. Safeguards were provided to inhibit boost when the essential fluid was depleted. Testing predicted the 5 quart supply would last nearly 1000 miles. BEATING CHEVY’S CORVAlR MONZA TURBO TO MARKET BY A FEW WEEKS (AND BMW AND PORSCHE BY A DECADE) GAVE OLDS BRAGGING RIGHTS FOR THE WORLD’S FIRST TURBOCHARGED PRODUCTION MODEL. Osmobile’s 1962 JetRocket V-8 topped by a Garrett AiResearch turbocharger fed a single-barrel Rochester downdraft carburetor. Five psi of boost raised output to 215 horsepower at 4800 rpm and 300 pound-feet of 3200. Those extra head bolts? Oldsmobile designed them into its version of the 215 to help avoid warpage and blown head gaskets on the turbo variant. The pistons, the bearings, and the valves were also upgraded. Proud of their achievement, Oldsmobile engineers Gil Burrell, Frank Ball, and James Lewis concluded their Turbo Rocket tech paper by saying, “This engine is a development that will be appreciated by all engineers, performance enthusiasts, and other people interested in advanced mechanical powerplants.” Car and Driver technical guru Roger Huntington dubbed the engine “the most radical design from an American factory in many years.” He rated the ’62 Olds Cutlass F-85 Jetfire “an elegant and comfortable high-performance car of medium size”. Unfortunately, GM’s hot small engine was caught out by radical changes sweeping through the industry. For the 1964 model year—the dawn of the muscle-car era-—GM’s premium compacts grew into intermediate A-bodies powered exclusively by iron engines. Buick and Olds kept the V-6 and added larger V-8 options. Pontiac used a Chevy inline-six for base power and offered V-8s ranging from 326 to a wild 421 cubic inches. The aluminum 215 V-8 lasted only three model years, in part because it was a costly indulgence. The casting process suffered from porosity issues—seepage through the cylinder-block walls—and the high scrap rates gave top management the willies. If the porosity wasn’t discovered upfront, coolant contamination of the oil triggered an expensive warranty claim. Customers who used the wrong antifreeze suffered radiators clogged with aluminum deposits. Mechanics hurriedly changing spark plugs occasionally stripped threads in the aluminum heads. Oldsmobile F-85 Jetfire owners often ignored the dash light urging them to replenish their Turbo Rocket fluid. The most pressing issue was fewer than 10,000 turbo cars sold, resulting in its cancellation after only two model years. Some dealers even stooped to removing the booster for disgruntled customers. The Corvair Monza Spyder also failed to top 10,000 sales in 1962, suggesting that turbochargers were too mysterious for most small-car buyers. On the opposite side of the earth, Oldsmobile’s light, compact V-8 was held in higher regard. Australian racing driver Jack Brabham commissioned auto-parts supplier Repco to base a Formula 1 V-8 on the Olds block endowed with SOHC heads and a flat plane crankshaft to produce more than 300 horsepower from 3.0 liters. That shrewd move earned Brabham the 1966 drivers’ and constructors’ titles. This was the first and last time an engine with American production-car roots prevailed in Formula 1. Britain’s Rover also took advantage of GM’s aluminum V-8. By the early 1960s, the 3.0-liter F-head inline-six that powered its flagship sedan was overdue for replacement. On a visit to the States, Rover’s managing director, William Martin-Hurst, stumbled across a Buick V-8 that Mercury Marine intended to install in a boat. The engine was instead shipped to England, where Rover engineers concluded it would suit their needs. In 1965, Rover inked a deal with GM that included all rights to the aluminum V-8, tech data, blueprints, and a few used engines. Designer Turlay, about to retire from Buick, moved to England to assist the production restart. Apparently, it didn’t occur to anyone at GM that Rover would be competing against GM’s own European brands, Opel and Vauxhall, with the exiled engine. Rover switched block manufacturing to conventional sand casting with pressed-in cylinder liners to solve the porosity problem for good. Starting with the P5 sedan in 1967, Rover’s 184-hp V-8 graduated to the P6 a year later and to the Range Rover luxury SUV when it debuted in 1970. The enduring success of the Land Rover brand in our market is the direct result of its arrival with a smooth, potent engine. Growing in steps to 5.0 liters, the aluminum V-8 thrived in MGS, Morgans, Triumphs, and TV Rs and stayed in production until 2004. The remanufacturing firm MCT then took the baton to continue the supply of engines to Britain’s low-volume specialty brands until 2010. Without this V-8, the Japanese would have annihilated British sports cars as quickly as they had laid the U.K.’s motorcycle industry to rest. GM’s courageous aluminum and turbocharging initiatives yielded several worthy permutations of the original Buick 215 V-8, notable racing success, and millions of satisfied customers. In life, as in the engine lab, tenacity pays off. As you all know, I have several Morgan cars. Each of these cars is different and each of these cars needs to be maintained in a different manner. For each car, I have identified a number of maintenance tasks that need to be accomplished at specific times and/or mileage intervals. I also have a tracking mechanism (computer program) that keeps me from forgetting to change the oil or check the lights on a given car. These maintenance tasks have been identified over time through personal experience, found in published books, MMC handbooks, or recommended by others with similar cars. These lists have evolved over time, and continue to evolve. These service lists may seem excessive or not accurately match your specific list, but I thought I would provide them, not as gospel, but as merely a suggestion, starting point, or food for thought. In each of these service lists there are also likely to be duplicate tasks, misspellings or other editing problems. My apologies, these errors get fixed as I find them, as this really is a work in progress. These service lists are provided as Microsoft Excel files (*.xlsx) which should be readable and/or editable by just about everyone. If, however, you cannot read and/or edit these file, and want to, just let me know. I will find another format that works for you. There are certainly others of you that are far more technically inclined than I am and can offer some very good advice (send me an email!) on what I should change. *Check your owner’s handbook for your vehicle’s oil capacity. **If you plan to change your oil regularly, consider investing in a small tool set, an oil filter wrench set, a quality floor jack and jack stands. Step 1 – Park your car on a level surface and apply parking brake. Run your engine for 5 minutes before draining oil, as warm oil drains faster than cold. Do NOT drain oil that is at full operating temperature as it will be too hot to safely handle. It is recommended that you remove the key for the ignition to preclude any accidental engine starts. Step 2 – Jack your car up and place it on jack stands. A jack alone will not safely support the full weight of your car. Consult your manual for the proper jacking points. The placement of a jack stand is just as important as the jack placement. The wrong placement can damage your car’s suspension or body parts. Step 3 – Locate the oil drain plug and place the drain pan below. The oil drain plug is usually near the front center of the engine, but some vehicles have more than one plug. Check your manual for the exact location. Loosen the plug with a socket or wrench. Make sure that the drain pan is large enough to hold 4-5 quarts of oil or more. Step 4 – Unscrew the plug by hand. Remove the plug by hand. While unscrewing the plug, push it back towards the vehicle. This keeps oil from rushing out until you are ready to remove the plug from the hole. Note: For engines with oil drains on the side, the oil is likely to drain at an angle, e.g. squirt out a foot or so. Position the drain pan to catch it and be sure to adjust the pan’s location as it drains. Step 5 – Drain all oil. To speed up the draining process, remove the filler cap located on the top of the engine and allow air to enter from the top. Step 6 – Replace oil plug. Tighten the oil plug by hand and ensure it is not cross-threaded. Once the plug is snug, finish tightening it with a wrench or by hand. Always use a new drain plug gasket if you have one and never over-tighten the drain plug. Step 7 – Remove existing oil filter. Place the oil pan underneath the old filter to catch any remaining oil while unscrewing it. Remove the old filter using an oil filter wrench if you have one. [Sometimes a strap wrench can be used, or if necessary, stick a screw driver into the body of the filter to give you something to turn. Use a rag to clean the mounting surface. Make sure that the sealing O-ring from the old filter is not stuck to the mounting surface on the engine. Step 8 – Lubricate new filter and screw into place by hand. Lightly coat the rubber seal of the new filter with fresh oil. It’s usually not necessary to tighten the oil filter with the wrench. Refer to the filter’s instructions. Once the filter is installed, lower the car. Step 9 – Clean the oil filter neck and pour in the new oil using a funnel. Typically, you will use 4 to 5 quarts of oil, but check your manual for your vehicle’s oil capacity. 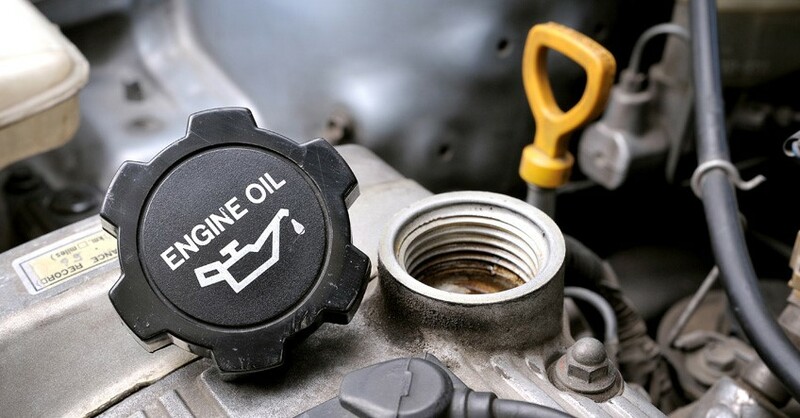 Fill to three-quarters of the engine’s capacity to avoid overfilling, as there is always oil that does not drain. Then replace the cap. Step 10 – Run the engine for a few minutes to make sure there are no leaks. Check the area around the oil drain plug and the filter for any leaks. If you notice a leak, shut the engine off immediately and remedy any leaks. Check the dipstick afterward and add more oil if necessary. Step 11 – Dispose of the used oil properly. Bring your used oil to a recycling center to recycle the oil for you (or many auto parts stores or oil change service business will take it but check with them first). These are the only acceptable methods for oil disposal. Make sure your car is securely supported. Record the date and mileage after you change the oil so you will know when your car is due for another oil change. Handle hot motor oil with extreme caution. Use mechanic’s gloves to keep your hands protected and clean. Learn about the different types of drill bits so you can choose the right ones for your project and for the material you’re drilling. High-Speed Steel (HSS) drill bits can drill wood, fiberglass, PVC (polyvinyl chloride) and soft metals such as aluminum. 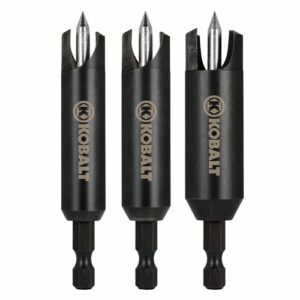 Cobalt drill bits are extremely hard and dissipate heat quickly. They’re mostly used for boring in aluminum and tough metals such as stainless steel. 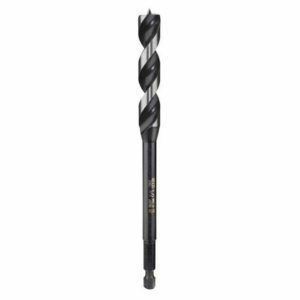 Black oxide-coated HSS drill bits have a finish designed to help resist corrosion and increase durability. They last longer than basic HSS bits and work well on a variety of materials, including metal, hardwood, softwood, PVC and fiberglass. Titanium-coated HSS drill bits produce less friction. They’re tougher than basic HSS bits and stay sharp longer. They work for drilling wood, metal, fiberglass and PVC. Carbide-tipped drill bitsstay sharp much longer than steel, HSS or titanium bits. They’re effective for drilling tile and masonry. 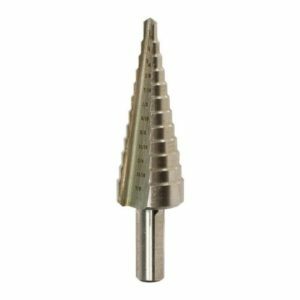 For a typical drill bit, the angle of the point helps determine what type of material the bit can drill. Flatter points — such as those with 135-degree angles — are suited for drilling into harder material. They may require a pilot hole to keep the bit from wandering. Bits with steeper points — such as those with 118-degree angles — are suited for softer material. They stay on center better and produce cleaner entry and exit holes. Bits with split-point tips improve drilling accuracy by keeping the bit from wandering when you begin to drill. Bit size reflects the diameter of the body. Some projects call for specific drill bit sizes, but a bit set that includes sizes from 1/16-inch to 1/4-inch will handle many jobs around the home and workshop. You can add larger bits – 5/16-inch, 3/8-inch, 7/16-inch and 1/2-inch bits if you need them. The chuck on a hand drill or drill press secures a drill bit to the tool along the bit’s shank. A smaller drill for work around the house typically has a 3/8-inch chuck. More powerful drills for heavier applications have a larger, 1/2-inch chuck. Drill presses also have larger chucks — 1/2-inch or 5/8-inch, for example. The bit shank size must not exceed the chuck size of the drill. A larger bit may have a reduced shank — a shank with a smaller diameter than the body of the bit — allowing you to use it with smaller chucks. A round shank allows you accurately center a bit in the chuck. A hex shank has flat surfaces, allowing the tool to grip the bit more securely for greater torque. Hex shanks such as the one in the image above work with quick-change chucks — common on cordless drills — allowing you to insert and remove them without tightening and loosening the chuck. 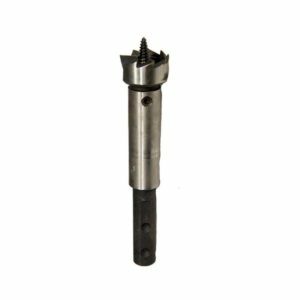 An SDS (slotted drive system) shank is designed for use on a hammer drill; it fits a spring-loaded chuck that doesn’t require tightening. The bit can move forward and backward with the hammering motion of the drill while flattened areas and slots on the shank allow the chuck to hold the bit. Twist Drill Bit – A twist bit is the most common type of drill bit for home use. It works for general-purpose drilling in wood, plastic and light metal. Brad-Point Drill Bit – A brad-point bit is designed for boring into wood. The brad at the center of the bit tip helps position the bit precisely for accurate drilling and produces a clean exit point in the work piece. The flutes — grooves that wrap around the bit and channel away chips and dust — are extra-wide to remove more material.Auger Drill Bit – An auger bit, another type of wood-boring bit, has a screw tip that starts the hole and pulls the bit through the work piece. These bits can be as long as 18 inches. As with the brad-point bit, large flutes help remove chips and dust. 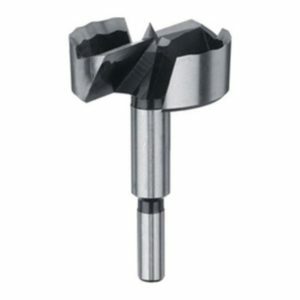 An auger bit with a hollow center provides even more chip removal, one with a solid center is stronger and more rigid. Self-Feed Drill Bit – A self-feed bit bores through wood. Like the auger bit, a screw at the tip helps position the bit and draws it through the work piece. However, this bit is more compact. It doesn’t have the standard flutes of a twist bit, so you need to pull the bit back periodically to clear away chips and dust. 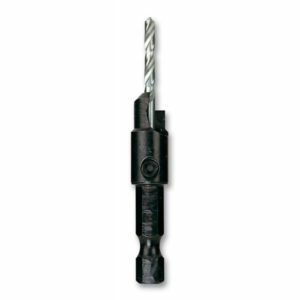 Installer Drill Bit – An installer bit is a specialized twist bit designed for installing wiring. The bit can be up to 18 inches long and drills through wood, plaster and some masonry. Once you drill through the wall, floor or other surface, you insert a wire into the small hole in the bit and use the bit to draw it back through the hole you bored. Spade Bit – A spade bit, also known as a paddle bit, bores large-diameter holes — up to 1-1/2 inches in diameter — in wood. It has a flattened blade with a sharp point that helps position and steady the bit. Some spade bits have points at the two edges that help create a neater hole and exit point. 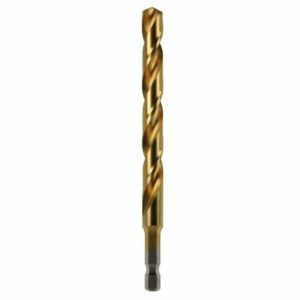 Forstner Drill Bit – A Forstner bit bores smooth, clean holes in wood. You can use it to create flat-bottomed holes — such as for receiving dowels. The design also allows you to overlap holes. A point helps you to position the bit precisely on the workpiece. Pull the bit out regularly to clear away chips and dust as you work. A hand-held drill may not always give you the force or control you need to use a Forstner bit, so a drill press is a better option for some applications. Hole Saw – A hole saw drills large holes — such as for installing door hardware or creating a pass-through for wiring. A hole saw creates a plug of waste material; a cut-out in the side of the saw cylinder allows you to push it out. Typically, a hole saw attaches to an arbor or mandrel which includes a shank. The arbor also holds a pilot bit for centering and steadying the cutting blade. 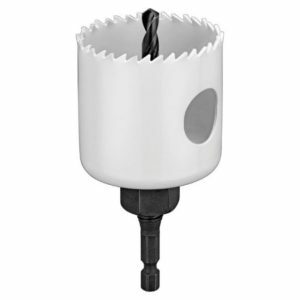 Some smaller hole saws have a built-in shank and don’t use a pilot bit. A bi-metal hole saw cuts through wood and metal. A hole saw with a carbide edge works on heavier materials such as ceramic tile and masonry. A hole saw with a diamond edge also works on tile and masonry, but cuts faster than carbide models. Countersink Drill Bit – A countersink bit — also called a screw pilot bit — is a specialty bit for drilling in wood. In a single action, the bit can drill pilot, counter sink and counter bore holes, allowing you to countersink a fastener and install a plug over the fastener head. Plug Cutter – A plug cutter bores holes in wood, creating wood plugs for use in concealing recessed fasteners. 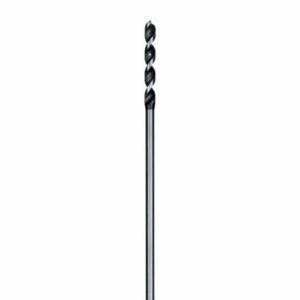 Step Drill Bit – A step bit is designed primarily for drilling in thin — up to 1/4 inch — metal, but will work with wood. 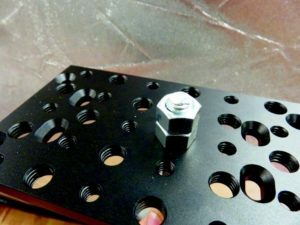 The stepped design allows you to use a single bit to drill holes with different diameters. Often the diameter of each step is etched into the bit. You can also use this type of bit to deburr holes, clearing away waste material. 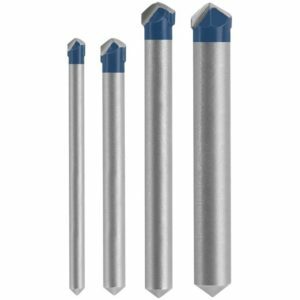 Tile Drill Bit – A tile bit uses a carbide tip to drill into some types of tile while reducing the chance of chips and cracks. Check the packaging to determine the tile it can drill. Masonry Drill Bit – A masonry bit drills into tough materials such as concrete, brick and other masonry. Some work with a standard corded or cordless rotary drill, but those designed for use with a rotary hammer or hammer drill can bore into masonry more effectively. The hammering action of the tool drives the carbide tip into the material while the rotating action channels away debris along the flutes. Drill saw bits cut irregular holes and contours in wood and metal. Pocket hole bits are included with pocket hole jigs. They allow you drill angled holes that accept screws for making wood joints. Scaling chisels work in rotary hammers or hammer drills for chiseling, scaling and chipping masonry. Depth stops prevent drilling beyond a predetermined depth. Driver bits and bit holders work on a drill / driver to install or remove fasteners. Drill bit extensions give your drill a longer reach. Screw or bolt extractors work with a reversible drill / driver to back out damaged fasteners. Right-angle attachments let you drill and drive in areas where a drill won’t fit. Drill / driver bit sets collect various sizes and styles of bits in a convenient case. It’s hot in Florida and most Morgan outings are top down. But when it rains, and it does that daily, you have to put the top up. Being in a Morgan with the top up, in Florida, is hot, very hot and humid. But, I have air conditioning in the Roadster. Yeah, right! Well, the Roadster air conditioner is the subject of many jokes, and none of them are good. If Morgan didn’t provide air conditioning, we would have suffered on, as we had before, but since the car supposedly came with ‘Air Conditioning’ we thought we were saved. Not so. It doesn’t work and if it does, it doesn’t work very well. The actual air conditioner lines are high pressure lines and are metal. They go into an air condition assembly box on the car’s firewall. This assembly box also houses the car’s heater core (sort of looks like a small radiator) and the heater / air conditioning fan. The assembly box is covered with some sort of temperature insulating material that is silver-ish. There is a knob about the size of a nickel near the upper right corner of the air condition assembly box (labeled as Condenser Knob, above, and shown as a red dot.) This knob is supposed to be fully rotated clockwise. This insures the air conditioning ‘compressor’ is not turned OFF. It is rumored that some cars simply had this knob set somewhat counter-clockwise and the air conditioning didn’t work. Also, inside the car, there is large rotating knob under the dash on the passenger side (LHD) that goes from Hot (Marked in RED) to Cold (Marked in BLUE). There is also a switch under the dash on the drivers’ side (LHD) labeled with a snow flake (for air conditioning). One side of the switch shows a vertical bar ‘|’ for ON and the other an ‘O’ for OFF. Rotate the ‘compressor’ knob (the small knob on the outside of the air conditioner assembly box.) fully clockwise. Turn the air conditioning switch (inside the car, under the dash) to the ON position (e.g. with the vertical bar ‘|’ for ON). When I do all this, I get semi-cool air blowing into the cockpit. Certainly, insufficient for the Florida heat and humidity. It is not new car cold air, more like really old car cool air (someone said tepid). I tried starting the air conditioning a few times, hoping for a different outcome each time. Nope the same each time, nadda, still tepid air. 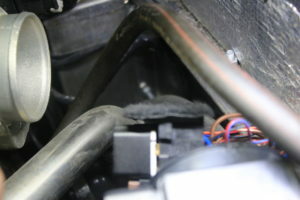 The fan (switch to turn the fan on and off is located on the dash) blows air through this hot heater core into the car’s cockpit. The air blown by the fan comes from the hot engine air leaving the forward bonnet louvers and then goes back into the engine bay via the rearward (near the windshield) louvers on the bonnet. This air then goes into the top of the air conditioning assembly box. This is the air that is used by the heater / air conditioning systems. Hot air is fine for the heater but isn’t too good for the air conditioner. Also, having these hot coolant lines and this hot heater core in the air condition assembly box cannot be good for getting cold air into the cockpit either. Fixing the air flow looks to be somewhat arduous, at least in my simple mind, however eliminating the hot coolant hoses feeding the heater core looks doable. So that is what I did. All this is really just to loosen and tighten hose clamps. Your car may have different hose clamps and require different tools. Well, the pry bar gave me some leverage with sticky hoses. 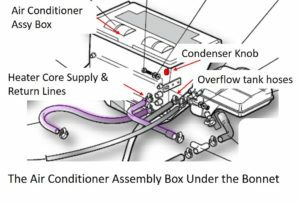 The hardest part of this task is getting access to the heater core supply and return coolant hoses where they connect into the air conditioner assembly box. Once you have access it is simply the matter of removing the two hose clamps that hold the hoses on the air conditioning assembly box and then joining the two hoses together with a 3/4 inch coupling. 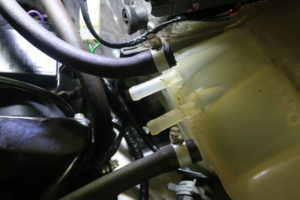 Remove the two small overflow tank hoses. Remove the hose clamps using slotted screwdriver. See picture of overflow tank with hoses removed, below. Relocate electrical relays attached via an attached Velcro patch. Simply pull Velcro away. 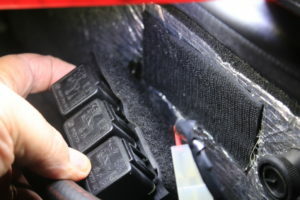 See picture of velcro on electrical relays and on air conditioner assembly box, below. Remove the large Air Flow hose. Again, remove the hose clamps and pull. The hose is fairly pliable. See picture of the void left when the the large air flow hose is removed, below. 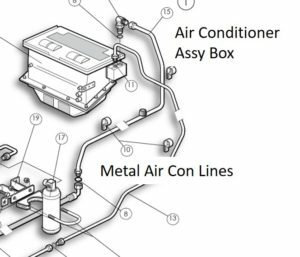 Now you can access the two hoses going into the air conditioning assembly box that carry the hot coolant water. Note: When you pull these away, you will have some spillage of coolant as the heater core is most likely full. It isn’t very much however. Simply connect the two hoses together using the metal coupling (I tried it with a straight coupling and it was too difficult to get the hoses in the correct position, so I opted for a 90° angled coupler. This was much easier.) I found the coupling at the local home improvement store. I suspect they are everywhere. This removes the flow of hot coolant from the heater core and of course, disables the heater. Now just put everything back. Put the large Air Flow hose back on. Again, use the hose clamps on each end and push and pull to get it set on each end. Then tighten the hose clamps. Put the electrical relays back onto their Velcro patch. Finally, reconnect the two overflow tank hoses. Re inspect to make sure everything is reconnected and tightened up. Take the car for a test drive. I think this simple modification greatly improved the performance of my air conditioning. It is still not extremely cold, but it is quite a bit cooler than before. Now, I suspect everyone’s car is different (these are Morgans, of course) so your results may vary. I also think that reworking the air flow, as discussed above, will improve the air conditioning some more. I believe a more elegant solution that addresses not only the hot coolant hoses, but also the hot air flow issues and a solution that doesn’t disable the heater, is in the works. I will probably opt for that solution when it is here and tested, however until then, this is about ‘as good as it gets’. Your Engine ‘oil filter’ is a very important component; it traps dirt and debris, preventing them from circulating throughout the engine. This protects vital internal parts such as bearings, journals, and cylinder walls. Another way the oil filter protects and helps lubricate the engine is using an anti-drain back-valve. This valve is predominantly used within the spin-on versions of today’s oil filter and not a part of the older style of cartridge style filters (such as the original style 1950s – 1960s Plus 4s filters). Although you may not have heard of it before or know what it does, this valve is extremely important. Extensive engine damage can result if it isn’t working properly. Tapping or cover plate: This is the plate at the bottom of the filter. It serves as an entry and exit point for oil. It also contains a threaded center hole, which allows the filter to attach to the engine. Filter medium: Dirt and debris are trapped in the filter medium. Typically, it is constructed from microscopic cellulose fibers along with synthetic fiber. It is then saturated with resin for added strength. The filter medium is folded into pleats to create a greater surface area. Center steel tube: The center steel tube provides a structure for the filter. It also allows filtered oil to return to the engine. Relief valve: The relief valve opens when oil pressure is too great due to clogged filter media. This allows unfiltered oil to exit through the center tube to prevent engine starvation. End disc: Some oil filters use an end disc to prevent unfiltered oil from leaking into the center tube. Others use a sealant instead. Retainer: As the name implies, the retainer keeps the filter medium and end disc tight against the tapping plate. Anti-drain back valve: The anti-drain-back-valve prevents oil from draining out of the filter when the engine is turned off. During an oil change, it’s recommended you put fresh oil in the new filter before installing it. This is so oil is available to the engine as soon as it’s started. The anti-drain-back-valve serves a purpose that’s like this oil change strategy. Every time your engine is shut off, the valve keeps oil from draining out of the filter. This allows the engine to receive oil immediately upon start up. A faulty anti-drain-back-valve lets oil drain back into the engine. This keeps oil from getting to the engine when it’s first started. The result is engine wear and eventual failure from lack of lubrication. Low-quality oil filters often have a poorly designed anti-drain-back-valve that doesn’t work properly. The best way to avoid anti-drain back problems is to use a high-quality filter. A good filter usually has a robust anti-drain-back-valve, designed to protect your Morgan’s engine. On-board diagnostics (OBD) is an automotive term referring to a vehicle’s self-diagnostic and reporting capability. OBD systems give the vehicle owner or repair technician access to the status of the various vehicle subsystems. 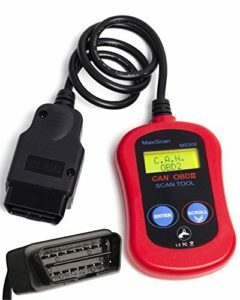 The amount of diagnostic information available via OBD has varied widely since its introduction in the early 1980s versions of on-board vehicle computers. Early versions of OBD would simply illuminate a malfunction indicator light or “idiot light” if a problem was detected but would not provide any information as to the nature of the problem. Modern OBD implementations use a standardized digital communications port to provide real-time data in addition to a standardized series of diagnostic trouble codes, or DTCs, which allow one to rapidly identify and remedy malfunctions within the vehicle. The EOBD (European on board diagnostics) regulations are the European equivalent of OBD-II, and apply to all passenger cars first registered within EU member states since January 1, 2001. 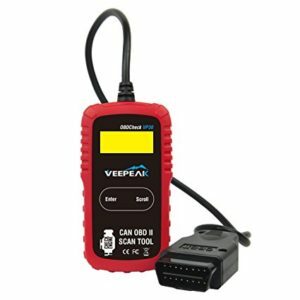 The technical implementation of EOBD is essentially the same as OBD-II, with the same SAE J1962 diagnostic connector and signal protocols being used. Each of the EOBD fault codes consists of five characters: a letter, followed by four numbers. The letter refers to the system being interrogated e.g. Pxxxx would refer to the powertrain system. The next character would be a 0 if complies to the EOBD standard. So it should look like P0xxx. The next character would refer to the sub system. P00xx – Fuel and air metering and auxiliary emission controls. P01xx – Fuel and air metering. P02xx – Fuel and air metering (injector circuit). P03xx – Ignition system or misfire. P04xx – Auxiliary emissions controls. P05xx – Vehicle speed controls and idle control system. P06xx – Computer output circuit. Charles Wakefield wasn’t slow to realise that here lay both an important new market for lubricating oils and, just as significantly, a whole new marketing opportunity also. The world was agog at the daredevil exploits unfolding on land and in the air; having your product name attached to such derring do was a golden opportunity to exploit what today we would call product placement. So Charles Wakefield determined to produce a new breed of oil for this new breed of machine, and make certain that the world knew of it. In the 1920s castor oil was removed from general motoring oils as mineral oil technology advanced, but its superior film strength ensured it a continued role in high performance engines. Only in 1953 was Castrol R superseded by R20, again containing castor oil but this time mixed with a semi-synthetic, and the successes began all over again. Mercedes-Benz immediately chose it for the advanced W196, Fangio scoring a first-time-out victory for both oil and car when he won the French GP in ’54. Even today castor oil remains the lubricant of choice in certain applications, notably methanol powered two-strokes because of its complete miscibility with alcohol fuels. As a result you don’t have to go to a historic race meeting to catch that distinctive castor aroma. Appropriately, it can even be smelt where enthusiasts fly model aeroplanes. Earlier this year, SCCA Solo Nationals week started off rather promisingly. A third-place trophy in the CAMInvitational gave us high hopes heading into the SCCA Championship event. But our excitement dropped to the ground when our inattention to a single bolt cost us a strong finish. 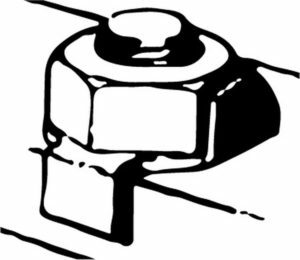 We want you to learn from our misfortune, so we put together a guide on keeping fasteners fastened. Description: Split lock washers are the most common type of locking device. They’re also one of the least effective, but they’re easy to produce and readily available. Split lock washers are flat washers that have been cut and “twisted” so that they create tension under the bolt head. In theory, this tension applies additional load to the threads and makes them less likely to back out. Typically, however, it takes far less torque to completely compress the washer flat than the fastener needs for proper hold. Pros: Readily available, inexpensive and ubiquitous. Cons: Doesn’t really do much. Should be used when: Loads are light and non-critical and nothing better is available. Description: Wave washers are similar in principal to the split washer, but this is a continuous loop with a “wave” shape that applies tension as the bolt is tightened. Drawbacks are very similar to the split washer, but the wave washer is kinder to the surface and will not leave burrs. Pros: Does not require a flat washer. Looks neat. Cons: Similar to split washers. Looks weird. Should be used when: You have a very light load and don’t want to use an additional flat washer. 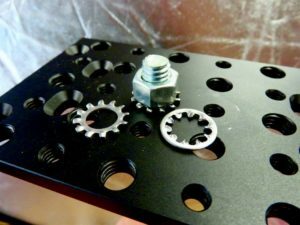 Description: Serrated washers are also referred to as “star” washers, which rather accurately describes their appearance. These are available with the “teeth” on either the inner or outside diameter of the washer, and work by physically digging into the underside of the bolt head as well as the (hopefully soft) surface against which they are used. Pros: Simple. Nice, direct mechanical operation. Cons: Not terribly strong. Not good on hard surfaces. Should be used when: You’re putting small fasteners into soft materials (aluminum, plastic, etc.). Description: A tab washer is a flat plate that is installed under a bolt head or nut, affixed to another fastener, then bent up to keep the primary fastener from rotating. Cool idea, but there’s an inherent weakness: Any material soft enough to bend will be soft enough to crush under the fastener’s tension. Good thing the tab washer is there to keep the bolt tight, because that tab washer is crushing under the bolt head and trying to make it looser. Pros: Easy to improvise. Ease of visual inspection. Cons: Inherently flawed, much like modern country music. Should be used when: You have nothing left to lose. Description: Commonly referred to as “nyloks,” these nuts feature a nylon collar insert that is a smaller diameter than the threads. When the nylon is engaged with the male threads, it forms a compression interface that keeps the fastener from turning on its own. Pros: Readily available, inexpensive, does not require additional bits of hardware. Cons: Still somewhat susceptible to vibration loosening, although will rarely back out past the point where initial bolt tension is lost. Should not be heavily reused. Heat can melt the nylon insert. Should be used when: Whenever you can. Good all-around performer from an effectiveness/ cost/availability standpoint. 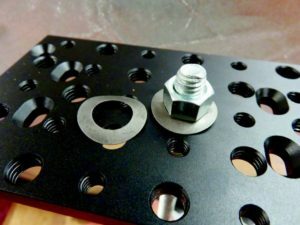 Everyone’s hardware assortment should include nylon locking fasteners. Description: Picture a regular nut, with regular threads for most of its length, but with an end that has been distorted into (usually) a more triangular shape, or “teeth” that are angled inward. When the nut is applied to the male threads, the force distorts the nut into a round shape, but the inherent tension creates a strong mechanical friction. Pros: Strong and very vibration resistant. The good ones (mil-spec) are surprisingly reusable and won’t damage the bolt’s male threads. Cons: This is a kind of specialized bit of hardware, so availability isn’t wide. Cheap ones will be one-time use and could mess up male threads when removed. Should be used when: You’re rich and can afford the mil-spec stuff. Use prevailing torque nuts when you’d usually use a nylok nut, but high temperatures won’t allow it. 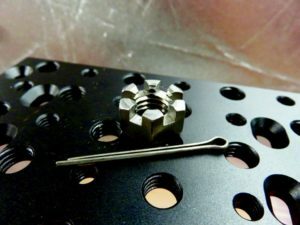 Description: Commonly called castle nuts, these feature a segmented top section through which a cotter pin can be inserted for use on a cross-drilled bolt. A similar-looking arrangement also works like the elastic stop nuts. In this version, the slotted parts are angled inward and create mechanical friction on the fastener when tightened. Pros: Very positive and visually identifiable locking. Cons: In some applications, aligning the slots with the hole may result in the application of either too much or not enough torque. Should be used when: Specific torque isn’t critically important, but retention is. Description: Most commonly referred to as “Nord-Locks,” which is actually a brand name of one of the more common versions, these wedge-locking washers actually feature a two-washer system that uses interlocking plates to create additional friction that prevents rotation. The washers have two toothed surfaces that fit together and provide torque counter to the direction of rotation. Serrated outer surfaces grip the bolt head and surface plate. Pros: Most vibration-resistant system that doesn’t use an external force (such as safety wire). Can be installed with common tools, just like a regular washer. Cons: Many times more expensive than regular washers. Serrations will mark surface it mates against. Should be used when: When you really need resistance to both vibration and rotation and don’t mind the extra cost. 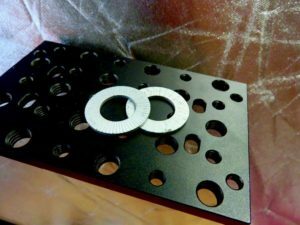 Wedge-locking washers are what we chose to lock down our Mustang’s Watts link; for mission-critical fasteners, they’re likely worth the cost. 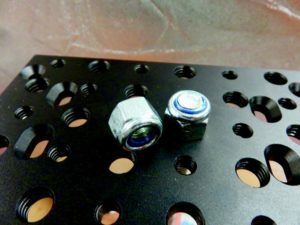 Description: As the name implies, and the microscopic closeup shows, these washers are embedded with crushed diamonds, which creates an extremely high-friction mechanical connection. The hardness of diamonds means these work very well on hard surfaces. Most widely used in the aerospace industry and among OEMs for stuff like cam bolts and crankshaft bolts. Pros: Strong mechanical connection. Works great for hardened surfaces, or surfaces without a lot of inherent friction. Cons: You’re not going to find these at Ace Hardware. This is specialized stuff with a price to match. Should be used when: Your ruby washers just don’t have the same panache anymore. Seriously, this is a good product for when you need a high-friction connection, but don’t want to introduce additional pieces as required by the wedge-locks. Description: A wire is passed through a drilled hole in the fastener and attached to another hard point to prevent loosening. Pros: Probably the safest overall solution, both structurally and for ease of visual inspection. Even a mediocre job of safety wiring is stronger than most other things on this list. Cons: Complex and time consuming. Requires additional specialized equipment and knowledge. Not good for anything that requires frequent removal. Should be used when: You don’t want something to come off, and you don’t intend to take it off any time soon. See also: every bolt on a helicopter. Description: Besides sounding like that party band your uncle was in during college that he just won’t shut up about (no, Randy, you never “almost got signed”-let it go already) jam nuts are one of the best “conventional” locking methods around. A jam nut is a second nut that is applied to a bolt’s male threads and then tightened against the first fastener. This produces opposing stresses and increases friction on the threads. Pros: Easy, cheap and reliable. Jam nuts are a go-to solution that’s easy to implement in the field. 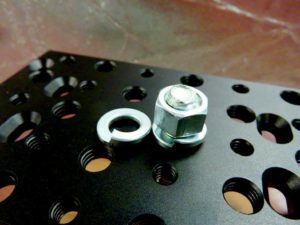 Use a nylok jam nut for even more reliability. Cons: Requires additional male threads to implement, so not suitable for some tight quarters. Should be used when: You need a reliable solution, but have limited stuff in your box. Or when you have the space available. Description: As the most prolific brand, Loctite has become synonymous with chemical thread lockers, but it’s just one of many high-quality brands out there. Thread locking compounds are anaerobic (meaning they cure in the absence of air) liquids or gels that effectively act as glue between the male and female threads. Books can and have been written about their use and properties. Pros: Easy to use, readily available and highly effective. Available in varying strengths and heat resistances. Cons: The joint is only as strong as the surface is clean. You always run out right when you need just a little more. Should be used when: Whenever possible. Lots of specific formulations for different applications means lots of options. Of course there are more solutions out there, and you’re ultimately limited only by cost, complexity and possibly access to secret government files. 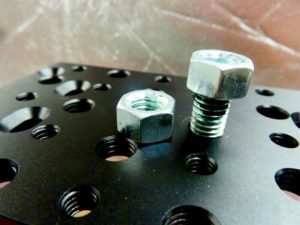 This should get you headed toward making good decisions about how to keep your fasteners in place. We highly recommend Carroll Smith’s “Nuts, Bolts, Fasteners and Plumbing Handbook” for in-depth discussions of many of the solutions we mentioned here. 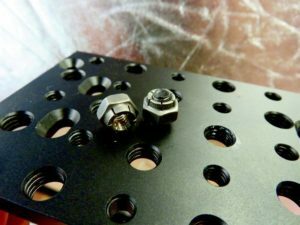 As for us, as we mentioned, we’re going with the wedge-locking washer system for now, coupled with a dab of medium-strength thread locker. We’ve also put a splash of paint on our Watts pivot and many other critical fastener connections, so we can easily see if there’s been any movement in these fasteners since they were last torqued.